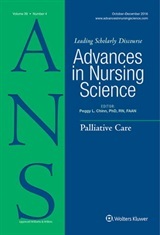 The latest featured article from the current issue of ANS is titled “Interpretation of Hospital Nurse Fatigue Using Latent Profile Analysis” by Diane Ash Drake, PhD, RN and Linsey M. Barker Steege, PhD. You can access this article here at no charge now while it is featured. Dr. Drake and Dr. Steege have each provided a message about their background and the work that has led to this article! Leave your comments here to join a conversation about their work. I have had the privilege to consult as the Nurse Research Scientist at Mission Hospital, Mission Viejo, CA since 2003. Nurse fatigue quickly became a focused research interest supported by a small team of hospital nurse leaders who understood the potential adverse effects of long work shifts, and wanted to better understand hospital nurse fatigue and investigate fatigue risk management strategies. During the initial literature search we reviewed several nurse fatigue dissertations and contacted one investigator, a human factors engineer, who fortunately joined our study team. I want to thank Dr. Linsey Steege who shares the authorship of this paper with me for her perseverant collaboration and brilliant research intellect. Ultimately, my investigation of hospital nurse fatigue is about supporting the important work of hospital nurses with the purpose of making fatigue risk management a reality. As an industrial and systems engineer, my overall research goal is to design work systems to improve health, safety and performance of health professionals, and by doing so, to benefit society by improving healthcare quality and patient outcomes. Human factors engineering is a focus area within industrial and systems engineering, which examines the interactions between humans, tools and technologies, the physical environment, and the organization of work in an effort to optimize human performance and well-being. In recent years, multiple agencies including the Institute of Medicine, the President’s Council of Advisors on Science and Technology, the National Academy of Engineering, and the Agency for Healthcare Research and Quality have pointed to the importance of partnership and collaboration between systems engineering, including human factors engineering, and healthcare. I feel privileged to be able to collaborate with Dr. Drake and the Mission Hospital nurse fatigue study team to better understand nurse fatigue in the context of the hospital nurse work system and work toward improved fatigue monitoring and risk management systems. The findings from this paper offer a new approach for measuring nurse fatigue and may be useful in developing more efficient fatigue monitoring systems and for evaluating the effect of fatigue risk management strategies.